I used to think I loved bacon. But honestly, I just don’t love it enough to cook it at home because of the mess. Bacon grease splatter is the worst, and my husband hates the bacon smell in the house — which then lasts all day. Oh and then you have to deal with all the bacon grease. Ugh. So much work. But my daughter Natalie loves bacon, and not just a little either. She really loves bacon. When she was little, if we set out a plate of bacon at breakfast, before we knew it, she’d eat every piece of bacon on the plate — even if we had guests over and it was enough for 8 people! If she had her way, we’d always have fresh cooked bacon on hand so she could add it to everything. Until one day, while scrolling through my Facebook feed, I saw something interesting. Someone was talking about cooking bacon in the oven. What?! How do you cook bacon in the oven? I was enamored with the idea. No more standing in front of a hot stove getting tiny burns from bacon grease splatter. No more bacon grease mess to clean up. Cooking bacon in the oven seemed like the perfect solution to making fresh bacon at home. So we gave it a try and now it is the ONLY way we cook bacon. First, you need baking sheets with edges to make sure the grease is contained. It also is much easier to remove the foil from this style of baking sheet when the bacon is done cooking. Second, preheat a convection oven to 400 degrees and line each baking sheet with foil, overlapping any separate pieces so the entire baking sheet is covered. Then add one layer of parchment paper on top of the foil. Line your baking sheets with foil and then add a single layer of parchment paper. Third, place the strips of bacon on the baking sheets close together, but not overlapping — otherwise the bacon strips will stick together. If I am going to cook bacon in the oven, I want to make sure I cook at least two full packages at a time so we have lots eat right away and lots of store in the fridge for later to eat on sandwiches, burgers, and wraps, or to add to pizzas and pastas. Place strips of bacon on your baking sheet. How much bacon you’re cooking will determine how close your bacon strips need to be to each other. Just make sure they don’t overlap. Fourth, place all of the sheets of bacon in the oven and set a timer for 15 minutes. Total cook time for the bacon is usually around 20 minutes — it varies brand to brand — but you want the timer set earlier so you can watch t carefully for the last 5 minutes. Your bacon will go from just about perfect to charred, burned, icky bacon in the blink of an eye. Trust me. I’ve done it and it’s so sad. 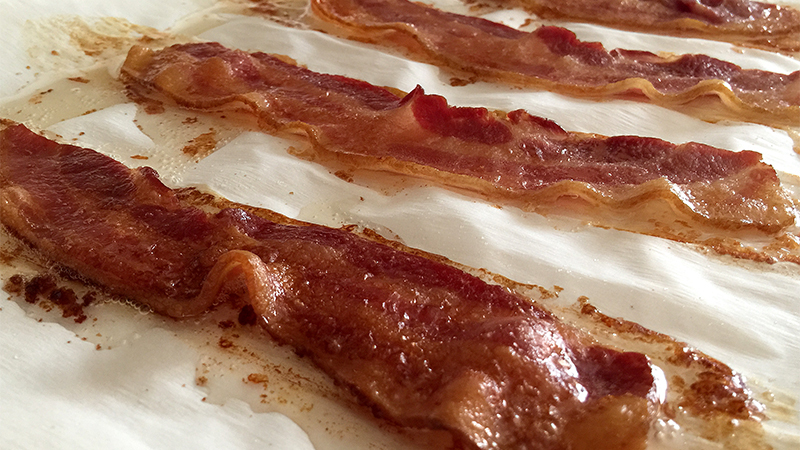 The trick to cooking bacon in the oven with no mess, is first lining your baking sheets with foil, then layering a piece of parchment paper over the foil. When you cook bacon in the oven, the bacon strips stay flat and there is no grease spatter! But watch your bacon carefully in the last 5-8 minutes, because they go from almost perfect to burnt mess in the blink of an eye. When your bacon is done, remove it from the oven, transfer all of the bacon to a paper towel lined cutting board or baking sheet to absorb any extra grease. You can serve the bacon immediately, or pop it into a storage container and pop it in your fridge to eat later. If you’re cooking bacon to save and have on hand later — for sandwiches, burgers, baked potatoes, and wraps — take it out of the oven a few minutes early. That way when you heat it up later, it doesn’t get too crispy. Clean up for oven baked bacon is a breeze. Working your way around the edges of your baking sheet, peel the foil away and fold it toward the center of the baking sheet, trapping the bacon grease and the parchment paper inside. Folding the foil and parchment paper toward the center of the baking sheet, traps the grease inside. Repeat, folding the foil toward the center of the baking sheet again, until you’re left with a foil ball that completely contains the mess. We then walk the foil balls of bacon grease out to our outside garbage can and put the baking sheets away. Done! Continue folding up your foil toward the center of your baking sheet until it’s a small foil ball. Take it to the trash, put away your baking sheet. No mess. And that’s it. No grease splatter to clean up. No big mess. No pan or tray of bacon grease to clean up. Just delicious bacon. When you cook bacon in the oven, the bacon strips stay flat and there is no grease spatter so clean up is a breeze. Preheat convection oven to 400 degrees. Line your baking sheets (with edges) with foil, completely covering the entire baking sheet. 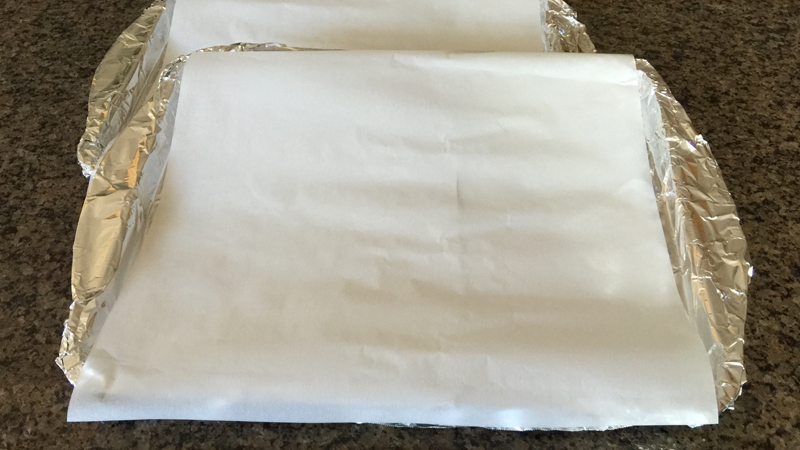 Layer a piece of parchment paper over each foil lined baking sheet. Arrange bacon strips in a single layer on the backing sheets. It's okay if they are touching. Get as many strips on your sheet as you can, just make sure they don't overlap. Put the baking sheets in the oven and cook for 20 minutes. At the 15 minute mark, watch the bacon carefully — it will go from almost perfect, to burnt mess quickly. Remove bacon from oven when ready and immediately transfer to a serving tray or plate lined with paper towels (to absorb extra grease). Serve immediately or cut strips in half and save for later. To clean up, simply fold the foil into the center of each baking sheet, and roll it up into a ball, trapping the grease inside, and throw it away. Thick cut bacon will take longer to cook. Depending on the thickness, it may take up to 25 minutes. While on vacation recently at a VRBO, the oven wasn't very powerful and it took almost 35 minutes to cook our bacon in the oven. The first time you cook bacon in the oven, watch it carefully to discover the best cook time for your oven.